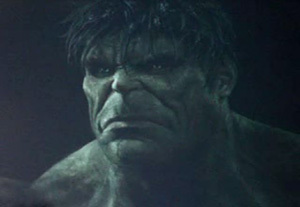 Hulk appears in the first sequence in the film. No waiting around for the green monster’s appearance. Bruce Banner is hiding out in Brazil in search for exotic flowers that he believes will help destroy the gamma radiation in his blood. While working at a bottle factory, Bruce is cut and a drop of his blood falls into one of the bottles. A woman in Minnesota drinks the juice and almost dies. The gamma is detected in her blood and this alerts the military. Bruce escapes to the States, meets up with Betty Ross, and they both leave for New York City to find Dr. Sterns, who has developed an “anti-dote” for Bruce. But they are caught by General Ross and the military. A soldier named Blonsky who was crushed by Hulk, takes a super gamma serum developed from Bruce’s Blood and transforms into Abomination. Hulk must save the city from Abomination. Read more plot details at IESB.net.